Were you there? Are you coming in 2020? As of April 17, 2019 - 30 classmates have said they are coming to the reunion and 17 more responded to the survey saying maybe. Are you among them? 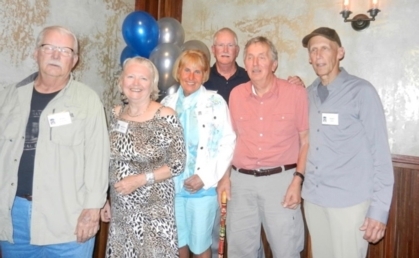 Our Reunion Committee is Joy Grass, Ken Cook, Bob Shapiro, Dennis Mandel Carolyn Korona, Lynn Falconer and Marion Snyder. First time users, look to your left and see the menu board. Click on Classmate Profiles. Scroll down to your name and click on it. Fill in your profile with whatever you want to share. Include at least city and state. Then at the bottom of the page is the level of security you desire. You can keep your entire profile open to the public or you can lock out everyone but member classmates. After that don't forget to hit Save. Then you are in and welcome to your site. If you have any questions, comments or concerns, please feel free to send us a message by clicking on the ‘Contact us” button at the left.